Riverside Village Hall is located at 27 Riverside Road, Riverside, IL 60546; phone: 708-447-2700. Photo: F. F. Tomek House (The Ship House), ca. 1906, 150 Nuttakk Road, Riverside, IL. 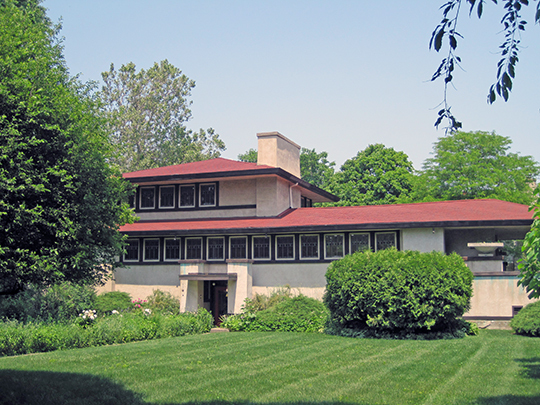 Designed by Frank Lloyd Wright in 1904. Listed on the National Register of Historic Places as a National Historic Landmark in 1999. Photographed by User:Teemu08 (own work), 2011, [cc-by-3.0 (creativecommons.org/licenses/by/3.0)], via Wikimedia Commons, accessed January, 2014. The entire village was designated a National Historic Landmark in 1970. Riverside, outside Chicago, platted by Frederick Law Olmsted and Calvert Vaux in 1869 for the Riverside Improvement Company, further articulated the ideal for the Picturesque suburb, earning a reputation as the archetypal example of the curvilinear American planned suburb. Located on the banks of the Des Plaines River along the route of the Burlington Railroad, Riverside is recognized as the first clearly documented example in the United States where the principles of landscape architecture were applied to the subdivision and development of real estate. Olmsted's plan provided urban amenities and homes that, built at a comfortable density, afforded privacy in a naturalistic parklike setting. The first design requirement was a tranquil site with mature trees, broad lawns, and some variation in the topography. The second was good roads and walks laid out in gracefully curved lines to "suggest leisure, contemplativeness, and happy tranquility," and the third was the subdivision of lots in irregular shapes. Designed to follow the topography, the curving roads were built without curbs and placed in slight depressions, making them less visible from the individual lots and enhancing the community's pastoral character. Riverside established the ideal for the spacious, curvilinear subdivision which would be emulated by developers, planners, and home owners for generations to come. Linda Flint McClelland, Historian, National Park Service; David L.Ames, University of Delaware; Sarah Dillard Pope, Historian, National Park Service, Historic Residential Suburbs in the United States, 1830-1960, multiple property nomination document, 2002, National Park Service, National Register of Historic Places, Washington, D.C.